Sarah Sousa obtained her Master of Science degree in Health Studies and Gerontology from the School of Public Health and Health Systems, at the University of Waterloo in November 2013. 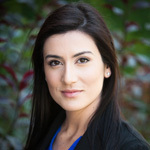 She specialized in Program Evaluation and has competed and been a finalist and winner in the Canadian Evaluation Society’s National Student Case Competition. Her other focus (including courses, publishing, volunteer positions) was in the field of Aging. She has two years’ experience working with the Schlegel Villages and the Schlegel-UW Research Institute for Aging (RIA), conducting research that informed and improved programs and the well-being of village residents. Sarah is skilled in project management and shines with technology. She is a committed longtime volunteer with CNIB and the Arthritis Society. Sarah’s role at HRI is to coordinate and facilitate research and evaluation activities by working directly with clinicians and external scientists.